Infliximab therapy is associated with very good results in the treatment of some sarcoidosis patients however, like in other new therapies, its use in clinical practice leads to the appearance of unknown side effects. The authors describe a case of a patient with pulmonary and ocular sarcoidosis who was submitted to therapy with Infliximab. Shortly after its initiation the patient developed de novo heart failure, and in spite of having hypertension and being overweight, our patient never presented previously with cardiac failure symptoms. We believe there’s a link in our patient between de novo heart failure and Infliximab use. Given the knowledge in the pathogenesis of granuloma formation in sarcoidosis, TNFα antagonists (specially Infliximab) appeared as a new tool for the treatment of patients who were resistant to conventional therapy or developed intolerable side effects [1,2,3]. TNFα was also believed to have a role in the evolution and progression of heart failure but the ATTACH trial failed to demonstrate a benefit of anti-TNFα’s use . Despite controversies there are presently several reports that demonstrate a trend towards an increase in the incidence of heart failure associated with anti-TNFα therapy, however, none were statistically significant [5,6]. history A 59-year-old woman and former smoker was asymptomatic until 1993 when she presented with a first episode of bilateral panuveitis. She was treated with topical steroids with improvement of symptoms although she had recurrent episodes which demanded treatment with systemic steroids. In 2004 she was referred to our sarcoidosis clinic due to arthralgia, weight loss and fatigue. A diagnosis of sarcoidosis was supported by evidence of stage II pulmonary involvement, high ACE and calcium levels, lymphocytic alveolitis (18%) and the presence of non-caseating granuloma on open-lung pulmonary biopsy. Of note, on her past medical history we highlight arterial hypertension and obesity. She performed transthoracic echocardiogram which revealed a normal global systolic function (ejection fraction of 76%; systolic pulmonary artery pressure of 22mmHg); cardiopulmonary exercise test was inconclusive due to lack of cooperation and a CT-scan demonstrated a mosaic pattern suggestive of constrictive bronchiolitis along with mediastinal adenopathies and pulmonary micronodules. In 2008 worsening of panuveitis and severe vasculitis of the posterior pole was noted as well as aggravation of fatigue and pulmonary interstitial involvement (DLCO fell from 78 to 54%) so she was prescribed Cyclosporine and Prednisolone. She completed 18 months of Cyclosporine and maintained steroids. During this period fatigue and ocular symptoms persisted although she presented a rise in DLCO (80%) and resolution of micronodular pattern in CT-scan. Simultaneously the patient developed a major depressive disorder and significant weight gain aggravated by steroids. At this point we considered therapy with Infliximab to control ocular symptoms and as a way to reduce steroid use. Four months after initiating Infliximab (4 infusions), she was admitted to our department complaining of shortness of breath on exertion, severe fatigue, cough and purulent sputum. Chest X-ray was similar to previous exams. Laboratory tests presented CRP 2,4mg/dL and PaO2=54,2mmHg (room air). She was given antibiotics and in spite of resolution of cough and sputum, dyspnea and respiratory failure persisted. At this time NT-proBNP was determined (4421 mg/dL) and repeated echocardiogram demonstrating a dilated left ventricle (LV), generalized hypokinesis, a global systolic dysfunction (ejection fraction of 19%) and diastolic dysfunction. She underwent coronariography revealing coronary arteries without lesions and mean pulmonary artery pressure of 33mmHg. A cardiac MRI (Figure 1) was performed indicating an important compromise of LV function without wall edema or delayed-enhancement that could be suggestive of cardiac sarcoidosis involvement. Figure 1. 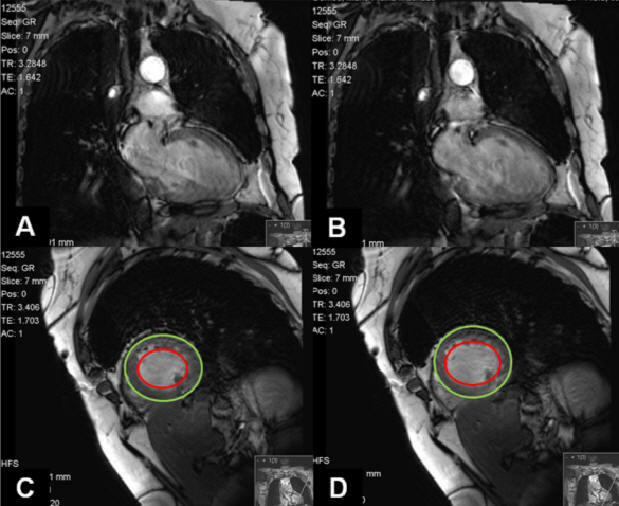 Cardiac MRI demonstrates important compromise of LV function. (A and C) Cardiac systole seen by closed mitral leaflets. (B and D) Cardiac diastole seen by open mitral leaflets. The area comprehended between the two circles represents myocardium thickness. There’s not a significant variation of this area when in systole or diastole. The patient prescription was then adjusted to treat heart failure with gradual improvement of dyspnea and resolution of respiratory failure. Currently, 6 months after the last Infliximab infusion, the patient still refers dyspnea on exertion and fatigue although she had improvement of ocular complaints. TNFα was first discovered in 1975 and since then much has been known about its pleiotropic effects. It acts via two different TNFα receptors (TNFR) . TNFR type 1 is responsible for deleterious and cytotoxic effects and TNFR type 2 seems to have a protective role in the heart. This explains in part why TNFα inhibition is not always beneficial due to the relative level of these receptors . Also, Infliximab when binding to transmembrane TNFα can cause cell lysis in the presence of complement . Even though we found some case reports documenting de novo heart failure in patients submitted to Infliximab therapy, we believe to be the first reporting this event in a sarcoidosis patient. Sarcoidosis is an inflammatory condition and several patients are submitted to corticosteroids which augments the potential for the development of cardiovascular disease. However, in spite of being treated with corticosteroids, being overweight and having hypertension, it should be stressed that our patient never presented previously with dyspnea, coronariography excluded coronary lesions and cardiac MRI wasn’t suggestive of sarcoidosis involvement. In the present patient we believe there’s a link between de novo heart failure and Infliximab. What we don’t know is if this is a causal bond or if Infliximab is responsible for unmasking or accelerating this myocardial deterioration. Conclusion Infliximab therapy appeared as a window of opportunity in the treatment of some sarcoidosis patients and its value is undeniable, as documented in several trials [9,10]. However, even though it has been used for more than a decade, Infliximab remains a young molecule which carries the responsibility of surveillance. It would be interesting to study these patients that presented with de novo heart failure during Infliximab use and to determine which features could predict such event. Feedback & comments If you would like to share any comments on this case please send them to wasog@gosker.nl and after peer review your comment(s) will be posted below.